Polar bears do not undergo true hibernation. Polar bears have longer necks, narrower heads and smaller ears compared to other bears. Their white or yellowish coat is made of water repellant hair on top of a dense undercoat. They have large feet to help them swim and walk on thin ice. The bottoms of their feet are nearly covered in fur. Polar bears are the size of large brown bears. The largest males can weigh in excess of 1700 lbs, but the average is 600–1200 lbs and 8–10 feet in length. Adult females weigh 400–700 lbs. Females are sexually mature when they are 3–6 years old. Males reach sexual maturity at 4-5 years of age, but are generally not successful breeders until after 6 years of age. The breeding season for polar bears is March through May. A male will find a female by following her scent and tracks across the sea ice. After mating, the development of the fertilized egg (blastocyst) is delayed and does not implant in the female’s uterus until about late September. Once the embryo begins to grow, the gestation period is only about 2-3 months. In October and November, a pregnant female will find a denning area either on land or on the sea ice. She creates her den by excavating a hole where snow has accumulated, usually along a river bank, coastal bluff, or out on the sea ice. As snow drifts form, she will increase the size of her den. The cubs (usually twins) are typically born in December or January, and weigh 1-2 lbs and must remain in the protection of the den until they grow bigger. By late March or early April when the cubs weigh ~20-25 lbs, they leave the den. For the first few days, the family will remain near the den, giving the cubs time to acclimate to the temperatures outside. After this time, the family group will travel to areas in the drifting sea ice in search of food. The cubs will remain with their mother for about 2 1/2 years and then the female will mate again. Ringed seals are the main prey of polar bears. Bears capture seals by waiting at their breathing holes. They may also hunt seals that are resting on the ice or they break into seal dens, called lairs, made in the snow and capture females or pups. 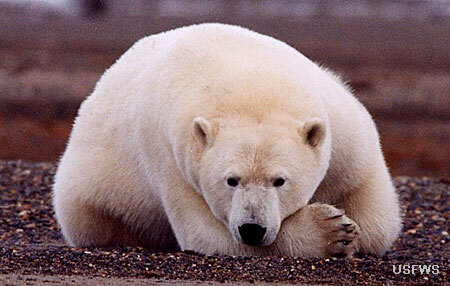 Polar bears also eat bearded seals, walrus, and beluga whales. Polar bears will feed on whale, walrus, and seal carcasses they find. When other food is not available, they will eat small mammals, bird eggs, and vegetation. Polar bears’ seasonal movements are driven by regional ice dynamics and can be quite extensive. Most polar bears remain with the pack ice as it recedes north during the summer melting season; however, along Alaska’s Beaufort Sea coast, some polar bears also come on land to rest until shore-fast ice begins to develop along the coast in late fall and the pack ice advances south, once again providing them with a suitable platform for hunting seals. In general, except for females with cubs, polar bears are solitary animals; however, marine mammal carcasses can attract large numbers of polar bears. Polar bears occur throughout the northern polar region. In the winter, polar bears in Alaska are found as far south as St. Lawrence Island and occasionally move down to St. Matthew Island and the Kuskokwim Delta. In the summer, bears are most abundant around the edge of the pack ice in the Chukchi Sea and Arctic Ocean. Denning areas include Wrangel Island and other Russian Islands, islands in the Canadian Arctic, Greenland, and Spitsbergen, and the northern Alaska coast. Mark-recapture, tagging, and genetic studies have shown that there are 19 separate populations of polar bears. Two of these populations are in Alaska: the Southern Beaufort Sea population and the Chukchi Sea population. 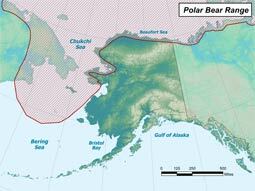 The Southern Beaufort Sea population is found along the north coast of Alaska and into the Canadian Beaufort Sea area. The Chukchi Sea population is in western Alaska, ranging as far west as Wrangel Island and eastern Siberia and as far south as St Matthew Island in the Bering Sea. Spring: Polar bears typically stay close to the pack ice, which provides them a platform for hunting seals. Pregnant females emerge from dens on land or barrier islands in spring. Summer: Most polar bears remain with the pack ice as it recedes north during the summer melting season. However, in areas long the Beaufort Sea coast, polar bears will come on land to rest until the shore-fast ice begins to develop along the coast in late fall and the pack ice advances south. Fall: Close to the pack ice; polar bears movements can be quite extensive and are driven by regional ice dynamics and ringed seal availability. Winter: Close to the pack ice. Pregnant females give birth in the den. The status of the southern Beaufort Sea sub-population of polar bears is declining; the status of the Bering/Chukchi seas sub-population is unknown. Polar bears are listed as threatened under the Endangered Species Act (ESA) because the sea ice on which they depend for hunting, feeding, reproduction, and seasonal movements is declining. To learn more, visit the ADF&G Special Status page for polar bear. Polar bears in Alaska were declining by the early 1970s. This decline was attributed to overharvest in the 1950s and 1960s from sport hunting which was legal and popular then. There was a moderate recovery during the late 1970s after the passage of the Marine Mammal Protection Act (MMPA) in 1972 when trophy hunting was banned and only subsistence hunting by Alaska Natives was allowed. In 2015, the Southern Beaufort Sea population is estimated to be ~900 bears and the size of the Bering/Chukchi seas population is unknown. Current and predicted future declines in sea ice led the U.S. Fish and Wildlife Service to list polar bears as threatened under the ESA throughout their range. Thinner ice and longer ice-free periods in summer may reduce the length of time polar bears have to hunt, and result in population declines. Oil exploration and drilling activities may pose some concerns for polar bears; bears can be displaced from high quality denning areas into less suitable locations. Contact with oil during an oil spill could reduce the insulation capacity of their coat and be toxic to bears. It could also negatively impact their food. Males: 600–1200 lbs., 8–10 ft.; Females: 400–700 lbs.